Windfarm project to preserve wreckage from 'battle' of the Isle of May - navy's 1918 catastrophe that left 270 dead. An underwater war grave containing the victims of one of the worst British naval disasters of the first world war has been surveyed for the first time so it can be preserved in the middle of a windfarm. The two K Class submarines were destroyed on 31 January 1918 during the so-called battle of the Isle of May, in which 270 lives were lost. The two submarines were sunk and three more damaged along with a surface cruiser. But no enemy ships were involved in the sinkings, 20 miles off Fife Ness on Scotland's east coast. The deaths were all caused by a series of night-time collisions within the British fleet. So embarrassing was the incident that even though one officer was court-martialed, the facts were not generally admitted for more than 60 years, until after the death of the last survivor. Jim Rae, secretary of the Scottish branch of the Submariners Association, said: "It was an absolute bloody disaster from the beginning. The K Class submarines did not have a very impressive record. You can see why those who served in them were known as the suicide club." The submarines proved far more lethal to their crews than to the enemy, so much so that the K was said to stand for Kalamity. Driven by oil-fired steam turbine engines, they were large and cumbersome, too slow to keep up with surface ships, hard to manoeuvre and stifling for their crews. Of the 18 that were built, none were lost in action but six were sunk in accidental collisions. 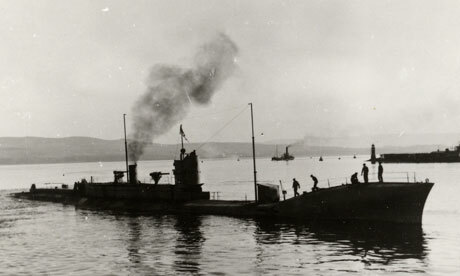 In January 1918, as British warships steamed north from Rosyth to join their fleet at Scapa Flow in the Orkneys, they were accompanied by two flotillas of the submarines. The first two subs found themselves bearing down on two minesweepers and changed course. The third, K14, veered to starboard to avoid colliding with them but performed a complete circle as its rudder jammed.